What Skills Are You Investing In? 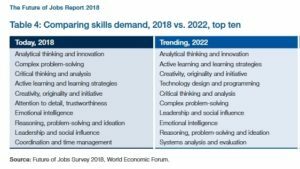 According to the World Economic Forum, analytical, creative thinking and complex problem solving, are key skills for now and over the next few years. The pace of change, particularly around working lives, requires a workforce that can remain flexible, think creatively and make effective choices. Understating how the brain might actually get in the way of these skills and having a kitbag of strategies to boost thinking power, may be more important than experience. Knowing how we have done things in the past will not be as useful as coming up with ideas on how to do things differently. Join me on the 25th January, 2019, to explore the kind of strategies that will open up options and creative problem solving. Impasse to Insight – creative problem solving for business. Memory – how does it work? We think of memories as something that we pick up along the way; little scars on our brains that show the journey that we have traveled. When we want to recall a memory we imagine that we go into a filing system, locate the memory and replay it from the original space on the hard drive. However this is not how memory works, not least because this is not how we perceive the world. Memory, memory storage and memory retrieval is much more like cake making. Our brains are like walk-in pantries with all of the different aspects of our experience (conscious and subconscious) stored in separate places on the shelves lining the walls. What we see is stored in a jar on a different shelf from what we hear, think, feel etc. The smell of an experience is placed in a jar right in the front, whereas sight is stored right at the back. The cook in the middle puts the ingredients into the various jars as they occur. Then when that memory needs to be recalled they go to the different jars and build the memory from the different elements; they reconstruct the cake. However, it isn’t the original cake, it’s a new cake formed from the ingredients. Which is why the new cake can be a bit wrong and is partly why two people observing the same thing can recall it completely differently. 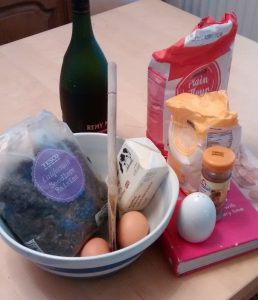 To learn something accurately we need to repeatedly make the cake, checking the recipe, using as many ingredients as possible, in order to make the connections between the correct jars really strong, bringing them to the front of the shelves. Then eat the cake. I’m not sure how this fits into the analogy, but eating cake is a great thing to do. And using your brain requires calories. We Notice What We Are Interested In … and ignore what we are not interested in. I heard someone describing how a group of people were talking about themselves and the work that they do. He was shocked by the words they used and how they were talking down their own impact. He made the connection between that and their inability to get to speak to senior people in their organisation. He then said “I hear it all the time”. At this point it became clear that he worked with individuals on their communication styles. And I thought “aha, you hear it all the time because you listen out for it.” I wondered whether he “heard” them talking that way because that was his interest. He had a theory and was applying that to this situation. A number of years ago I attended a workshop on dealing with conflict. The workshop was excellent. However, one of the attendees put in a complaint (and tried to include me in this “class action”.) His complaint was that the handouts were very badly produced. He was right, they were dreadful. However, the content of them was great and it shouldn’t have really undermined the day. But for this person it did. His job? He managed a reprographic department. For him the whole day was ruined because he couldn’t ignore the lack of professionalism over the handouts. You hear a word or phrase for the first time then hear it 5 times in the following week. Did the universe just make up its mind to keep sharing this with you? No, it’s just that you are filtering for it. I learned the word ambit today. I wonder how long before I hear it again. I train people to use PowerPoint effectively. It isn’t my life’s purpose but it does seem to figure a lot in my work. Consequently I notice a lot of poor practice. I try to ignore it but inevitably find myself making mental notes on how someone has done something wrong; drives me nuts. It has long been known that we quickly make up our minds about a person or situation and then look for the information to back our position or ignore information that contradicts it. Not great when you are map reading. Terrible if you are making judgements about people in an interview. Potentially lethal if you are trying to diagnose an illness. Next time you find yourself saying “I hear this all the time” ask yourself why you hear it a lot. Is it because this is what is said, is it because you are listening to a selection of people who are all saying the same thing (and why is that, by the way) or is it because you are filtering out other voices? People have their pet theories and then find lots of examples that back these theories up. I hear it all the time.